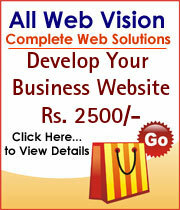 All Web Vision is a professional website design and web development company offering a variety of web services from basic Website Design to complete e-commerce websites including high-class website development, e-commerce solutions, and search engine friendly website design - SEO (Search Engine Optimization) allowing you to sell products online. We have designed and created +900 plus of successful websites since our inception, for many different types of businesses. Address: ALL WEB VISION Office No.11, 1st Floor, Goverdhan Tower, 150 Feet Road, Near Fly Over Bridge, Above Tata Indicom Gallery, Bhayandar (West) Mumbai - 401101. India.